I don’t know about you but with the holidays here we are spending a lot more time together as a family in the car. Between the usual errands, eating out, commuting, time driving back and forth to school, and visiting with family and friends, there’s also holiday shopping, visiting with extended family out of town, and vacations. With all of this time spent in the car with little ones during the coldest time of year, I want to make sure that our family has everything they need no matter what happens on the road. Imagine how awful it would be traveling somewhere and the road closed because of snow and you have your kids in the car with you. We’ve been there and it’s not fun. Something that would have been terribly stressful as an adult, gets infinitely more stressful when kids are involved and they’re just not able to process what’s going on. 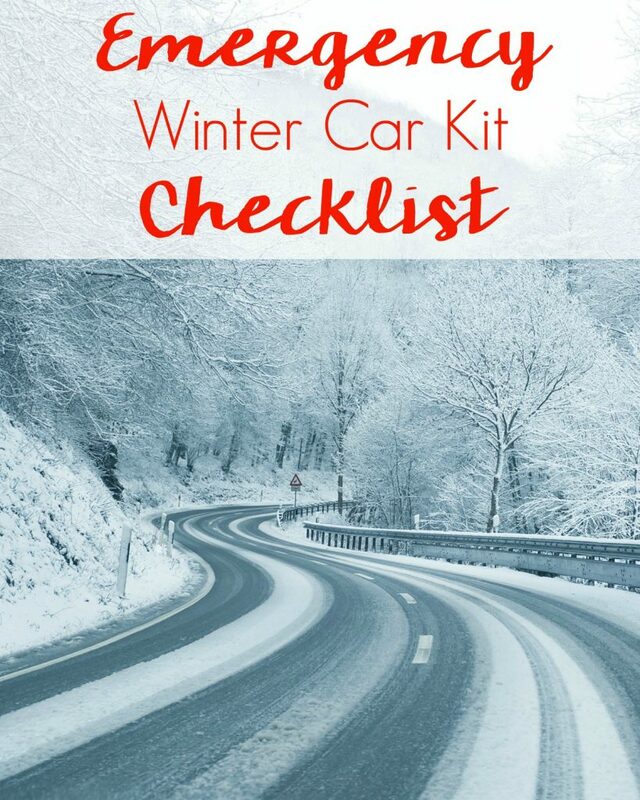 Being prepared and having an emergency car kit for your family is the key to traveling in the winter. While you can’t guarantee your kids won’t argue, or ask, “are we there yet for the hundredth time”, you can still reduce your stress from worrying about the unexpected with a little planning. This may not save you completely but will make things considerably more comfortable and likely to end well with as little discomfort as possible. Survival blanket. This space-saving blanket will keep you warm, if necessary, without taking up that much room. No matter what sized car you’re traveling in, there will always be room for this little thing. Road Flares. The weather in winter can be unpredictable and sometimes cell signals can be spotty, bring these flares along to help emergency vehicles and passing cars see you. Emergency radio with solar charging, hand crank charging, and flashlight. This little gem has so many tools packed into one and might just be what saves your family. Extra batteries. Presumably, these would be used for the emergency radio but if you have an additional flashlight or other electronics, then these could be super useful. First Aid kit. Even if there’s not a weather-related emergency, finding yourself with a sick child in the middle of nowhere is an emergency in and of itself. Being prepared for the unexpected with an emergency winter car kit First Aid kit will definitely settle your nerves. WaterWipes. Whether your kids are in diapers or out, having kids means lots of messes. For our little ones, we only want the best products to make sure our child is safe and happy. WaterWipes are durable and effective and able to clean up messes easily without irritating kid’s sensitive skin with harsh chemicals or fragrances. In fact, WaterWipes are chemical free and only contain two ingredients – 99.9% pure Irish water and 0.1% grapefruit seed extract. You’ll definitely want to keep these on hand for potty accidents, food mishaps, or for the motion sickness prone. Tires. Worn tires don’t perform the same as new tires. Make sure you check the tread before you take off.